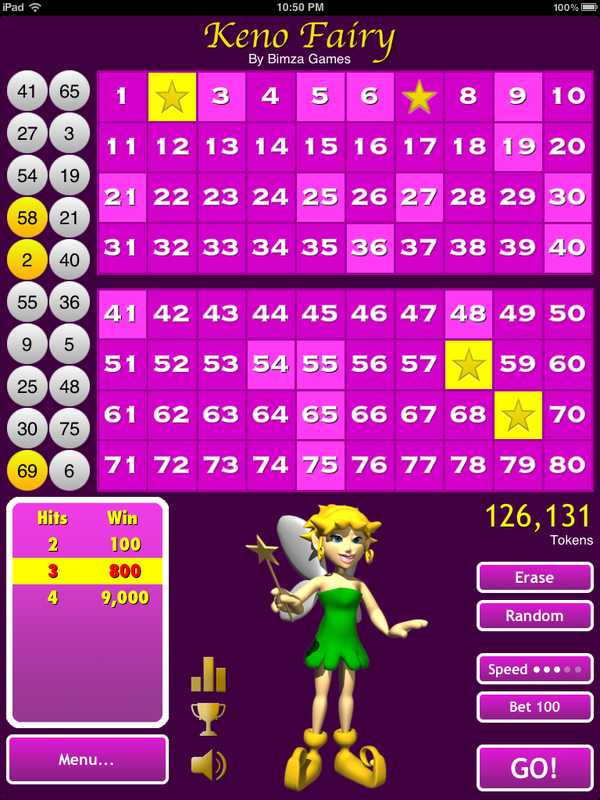 Keno Fairy is a Free Keno game for iPhone, iPad or iPod Touch! 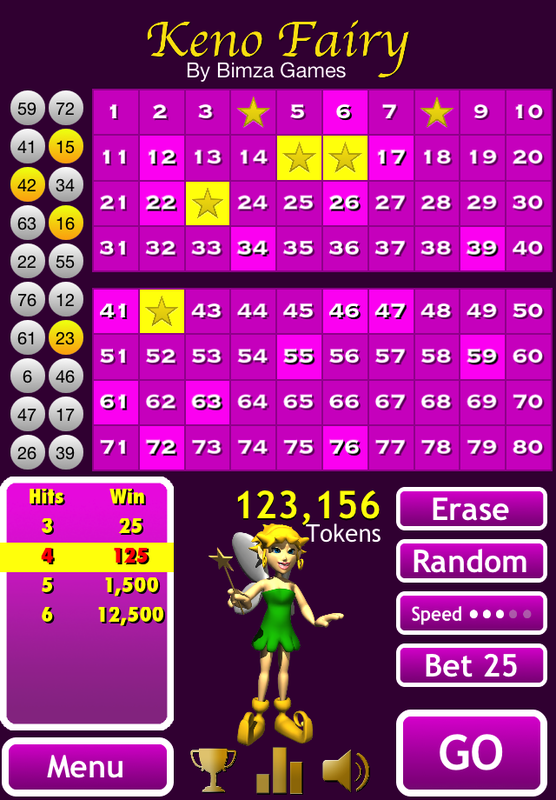 Keno Fairy for iPhone and iPad is traditional keno gameplay plus an exciting bonus feature. 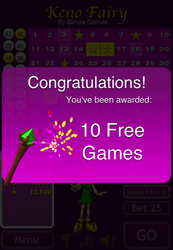 When the last number picked is one that you've chosen, on a winning game, you'll receive twelve free games. 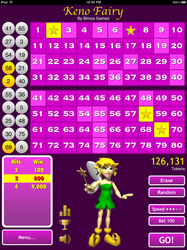 During those twelve free games, the Keno Fairy will help you out by making the first ball that comes up guaranteed to be one that you've marked. 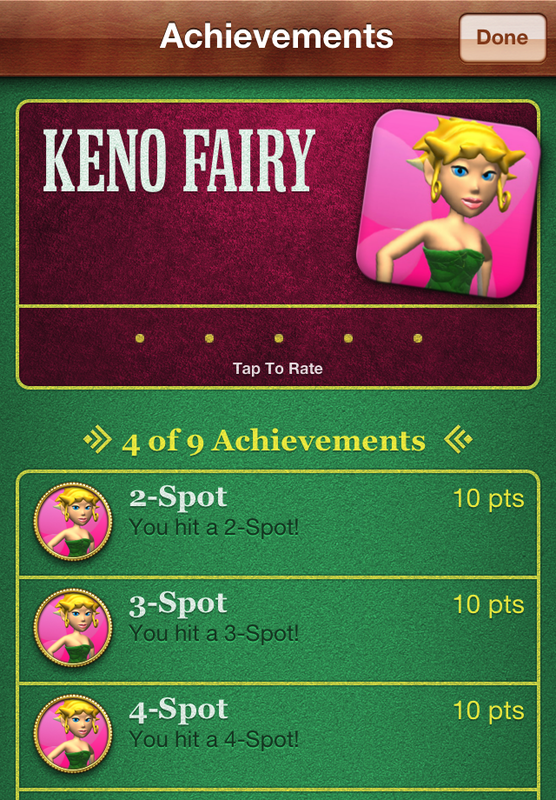 In addition to the free games feature, the Keno Fairy will randomly choose to start your game with one free marked spot. This means at the beginning of the game, you will automatically have one of your spots marked. 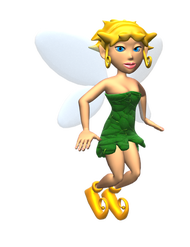 The Keno Fairy is all about increasing your chances of winning. Learn about the history of Keno. iPhone Keno VS Casino Keno? One of the most popular games in the world is Keno. One of the most popular phones in the world is the iPhone, so the fact that you can play Keno on your iPhone is a great match. 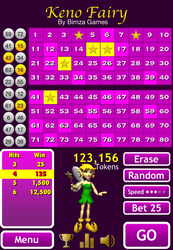 There are many iPhone keno games, and even some iPad keno games, but Keno Fairy is a universal Keno app that allows you to play Keno on the go. Since it's a universal free keno app, that means you don't have to buy it once for your iPhone and again for your iPad. And since it's a free Keno Game, you don't have to buy it at all! You'll be able to enjoy this free iPhone Keno game and save money from going to an actual casino. If you like other casino games like poker, Texas hold 'em, slot machines, roulette, or black jack, then you'll want to add this exciting Keno game to your iPhone or iPad's collection! 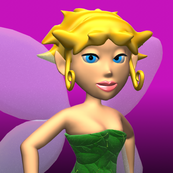 In Keno Fairy, we give you 100 FREE coins to play with every time you run out and you also have the option to get even more through Apple's in-app purchase. 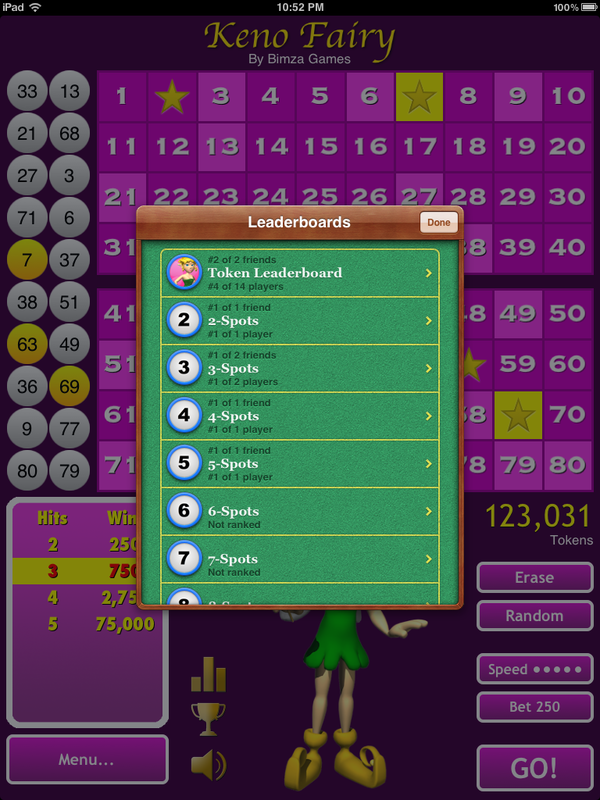 So you can play Keno Fairy for your iPhone or iPad and see if you can beat others high scores on the leaderboards! 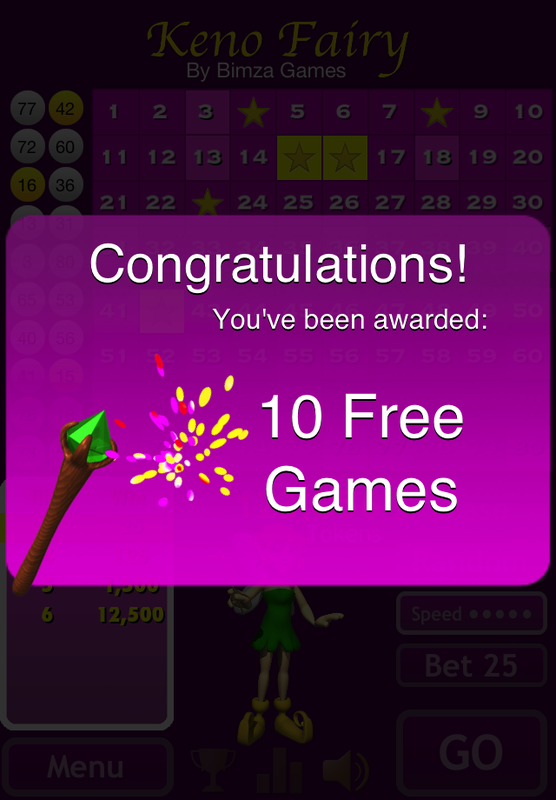 Hundreds of people around the world play this great free keno app every week. 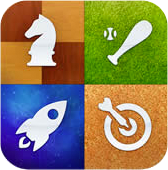 Their scores are tracked on Apple's Game Center leaderboards. Join the fun! 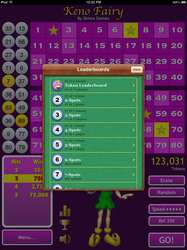 Download this free iPhone Keno app today and see how high you can make it on the built-in leaderboards. 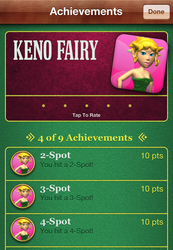 Keno Fairy is Free for all your iOS Devices. This means that you don't have to pay anything to enjoy playing this casino class keno game on your iPhone, iPad or iPod Touch. There are in-app purchases that allow you to get even more coins than the unlimited free coins we give you (100 at a time). If you choose, you can purchase 100,000 coins for only $.99 USD or get the best value and purchase 1,000,000 coins for only $1.99 USD. Purchasing more coins allows you to bet even higher and gives you a better shot at hitting it big. 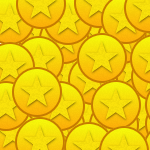 Many users have enjoyed purchasing more coins to achieve a higher ranking on the Game Center leaderboards.